The UK national press, including radio and television, reported on Monday June 13th 2016 a “new surprise and controversy” in respect coronary heart disease and survival. The report concerned a paper published in the British Medical Journal on-line edition. This was a meta-analysis of a number of previous publications linking survival to blood levels of cholesterol. The conclusion was that above the age of 60 years a high level of cholesterol is not a danger but it gives a survival advantage. Although this was regarded as a controversy, it will come as no surprise to readers of this Blog as I have indicated this finding on previous occasions. 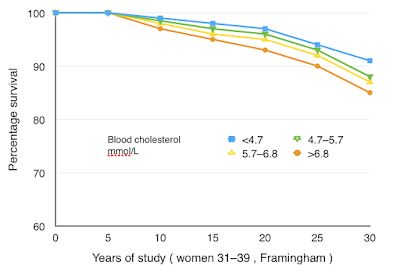 The most important cholesterol–survival study was in Framingham, Massachusetts, which I reported in a post in December 2015. This was a highly detailed follow-up study lasting for thirty years, and it will never be repeated. The major concern was the large number of deaths from coronary heart disease (CHD) during the epidemic, with large numbers of premature deaths. Now that the epidemic has almost come to an end there is no incentive for further detailed epidemiological study. Between 1951 and 1955, when the epidemic of CHD had become obvious and a serious public health problem, the study recruited 1959 men and 2415 women who were free of cancer and heart disease. They were between the ages of 31 and 65 years. 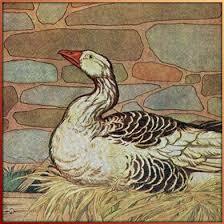 They were followed in great detail for thirty years, at the end of which the conclusion was clear. For the purpose of data analysis the subjects were grouped into quartiles based on the blood levels of cholesterol. 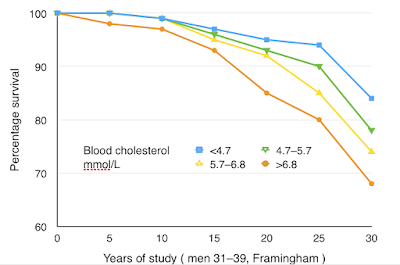 In Figure 1 we can see that in men aged 31–39 there was a survival advantage in those with the lowest blood levels of cholesterol, 84% after 30 years, compared to those with highest cholesterol levels, only 68% after 30 years. It can be seen in Figure 2 that the overall survival for 30 years was much better in 30 year old women compared to 30 year old men. 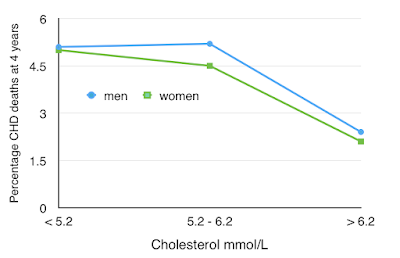 However in women of this age-group the survival advantage of a low blood cholesterol level was much less, 91% compared to 85% for the highest cholesterol levels after 30 years. 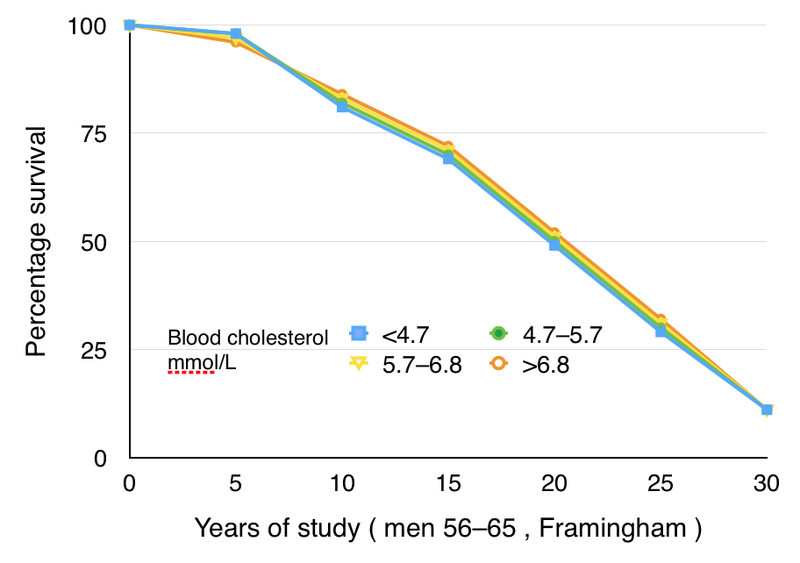 In Figure 3 we can see that in men aged 56–65 survival was not influenced by the blood level of cholesterol. We can also see that at that time only about 10% of men aged 56–65 lived to the age of 90. This conclusion was subsequently ignored. The Framingham study did not not recruit people aged above 65 years, but other studies have done. I have previously reported the Paris study, the Honolulu study, and the New Haven study. These studies all demonstrated something different. In the age group above the age of 70 years, those with the highest blood levels of cholesterol had the best survival. 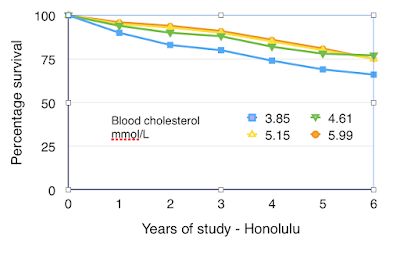 This can be seen in the survival curves in the Honolulu study, Figure 4, showing that those with the lowest blood levels of cholesterol had the lowest survival at 6 years. 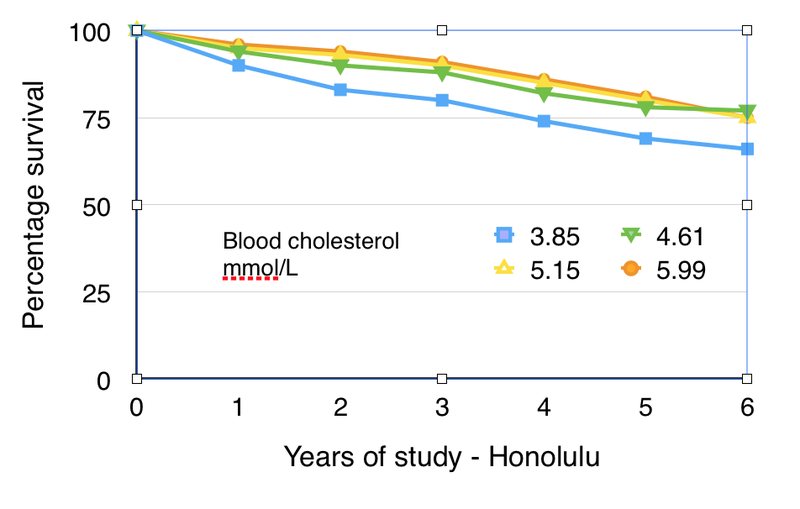 The conclusion of the Honolulu Heart Program was that "These data cast doubt on the scientific justification for lowering cholesterol to very low concentrations (<4·65 mmol/L) in elderly people". It would appear that no notice was taken of this study. Similarly, as shown in Figure 5, in the Paris study, the worst survival was in those with the lowest blood levels of cholesterol. The study carefully and successfully excluded any person who had cancer, which could have contributed to both low cholesterol and death. There was a further study from New Haven, Connecticut, showing that cholesterol was not an indicator of cardiovascular risk in the elderly. The data is shown differently from the other studies. The end-point of the study was the percentage of those who died from CHD after four years. This was grouped on three blood level groups of cholesterol, for men and for women. Figure 6 . Deaths from CHD at four years based on cholesterol level. New Haven. We can see in Figure 6 that in the New Haven study of people over the age of 70 years, the CHD death rate was highest in men and women with the lowest blood cholesterol levels.The authors of the study (highly respected) state that the results do not support the hypothesis that high cholesterol is a risk factor for death or CHD death in older persons. 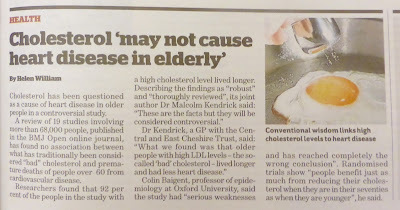 It is clear and it is not new that in people above the age of 60 years a high blood cholesterol is of no concern and if anything it is a good thing. But these results have been hidden from public view for a long time. Is is good that the information is now being brought to attention by the recent British Medical Journal publication. 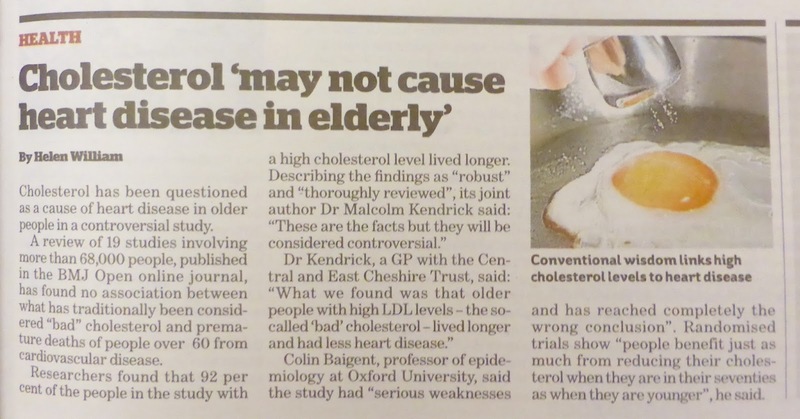 The conclusion that a high blood level of cholesterol (LDL-cholesterol) "may not cause heart disease in the elderly" and might be a good thing conflicts with “conventional wisdom”, led by pharmaceutical and academic vested interest. The misconception that cholesterol is bad fuels vast profits for the pharmaceutical industry and the academic departments that it supports (the main objective of these departments is the pursuit not of truth but of research funds). There is no justification in testing the blood cholesterol level in people above the age of 60 years. As I have pointed out in previous Posts, the problem is that the small benefit of statins is nothing to do with the ability to lower blood levels of cholesterol. 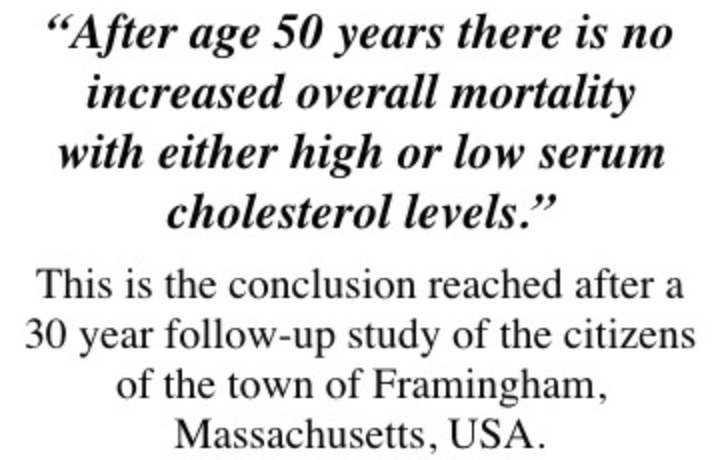 The so-called cholesterol experts always talk and write about “cholesterol-lowering with statins”. The clinical trials that they quote are trials of statin therapy, no more and no less. If we forget the cholesterol-lowering effect of statins then everything starts to make sense. Professor Colin Baigent, an epidemiologist at Oxford University, said the new study had “serious weaknesses and, as a consequence, has reached completely the wrong conclusion”. The study mentioned was not a clinical experiment or trial. It was a review of a number of observational studies of some size. The results were clear: high blood cholesterol in people above the age of 60 years gives a health and survival advantage. The conclusion in this respect is straightforward and to suggest that the study reached “the wrong conclusion” is absurd and a highly prejudiced comment: conclusions should follow a study and not precede it. 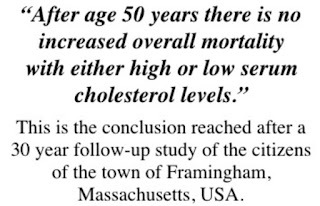 I wonder if Professor Baigent ever read the monumental Framingham study, and if so did that 30 year study also reach “the wrong conclusion”? "There is nothing in the current paper to support the author's suggestions that the studies they reviewed cast doubt on the idea that LDL-Cholesterol is a major cause of heart disease or that guidelines on LDL reduction in the elderly need re-evaluating." This quotation from Professor Baigent introduces “a drug”, something that was not the subject of the epidemiological studies. A professor of epidemiology should know better than to mix an epidemiology study with a drug trial. Statin drugs do reduce death rate by a small amount in all age-groups, but as I repeatedly mention, this is nothing to do with cholesterol-lowering. The clinical trials alluded to were of statin therapy: cholesterol-lowering and other metabolic effects were not standardised or controlled. The West of Scotland trial of statin therapy demonstrated after five years an absolute mortality reduction of 0.9% in men aged 65 years 4.1% in controls, 3.2% in treated group). As part of the analysis the participants taking the statin were divided into five groups based on the amount of reduction of blood cholesterol. For each of these groups the reduction of coronary events (compared to controls) was determined. When these were plotted together in a scattergraph, the result was as in Figure 7. There was no association between cholesterol reduction and reduction coronary event rate. 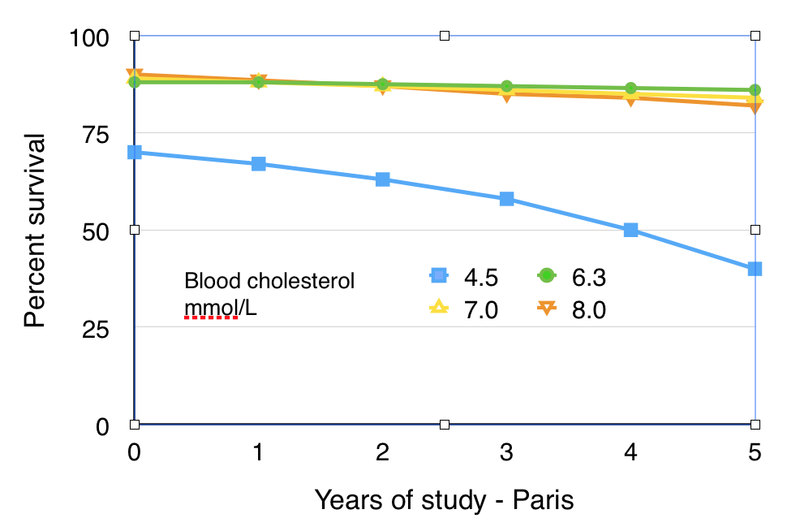 Surprisingly the reduction of events was greatest in those with no cholesterol reduction, but the significance of this is doubtful. 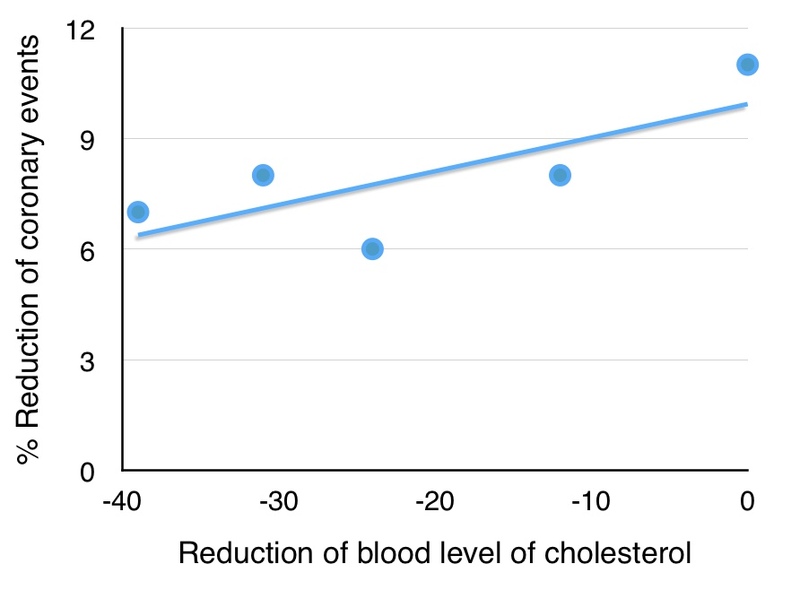 The event reduction in the three groups with cholesterol reduction was effectively constant. The trend-line is close to flat. Don’t forget that cholesterol-lowering with diet and medications other than statins (for example ezetimibe) has no effect on mortality: benefits are restricted to statins only. 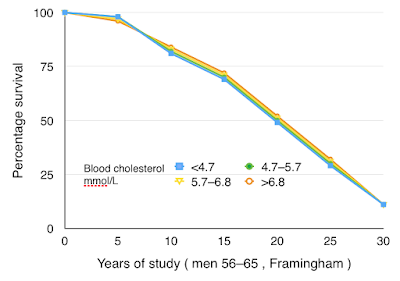 Let Baigent continue to support statin therapy, but accept that a high cholesterol above the age of 60 years is not a risk factor of CHD but has an advantage, as is demonstrated clearly. Following the report in the Daily Telegraph, the usual denial from well-known diet-heart-cholesterol enthusiasts appeared in The Times a few days later. We should simply forget about cholesterol. The use of statins should be regarded as an empirical prevention of CHD death. The prescription should be based on the sum of risk factors that must not include blood level of cholesterol, other than in men below the age of 50. The article headline indicated that because a high blood level of cholesterol is good rather than bad, statins are a “waste of time”. This logic is not correct as statins are of some benefit, but that benefit is not connected to cholesterol. There is a different beneficial effect, probably an anti-inflammatory action. This is generally not appreciated or understood. Statins are of only a small benefit. In the first placebo controlled statin trial conducted in the West of Scotland, the subjects were men of age 65 with about the world’s highest incidence of CHD death. The death rate in the placebo group was 4.1% after five years, and lower in the group treated with pravastatin at 3.2%, an absolute reduction of 0.9%. This meant that 100 men had to treated for five years to prevent (delay) one death. The population mortality rate in Scotland at that time was about 850 per 100,000 per year. It is now only about 15 in the UK, a reduction of 98%. If we use the proportionate death reduction rate of 25%, we can expect that if undertaken today (not possible in practice) and given the much reduced death rate, the placebo group would have a mortality rate of .074% and the treated group .056%. This indicates that 7400 men would need to be treated in the same way to prevent 2 deaths. The price of preventing (delaying) one death would then be £675,000, much more in younger age-groups. So statins do help but only a little and the help is very expensive. It is sad that highly qualified cholesterol experts are unable to separate cholesterol risk from statin benefit. Whenever anyone challenges the diet–cholesterol–heart hypothesis there is an immediate and thoughtless reaction to deny the challenge and to claim that the small success of statin therapy “proves” the highly flawed hypothesis (it proved nothing of the sort). Such an inevitable reaction was published in The Times on June 15th 2016. 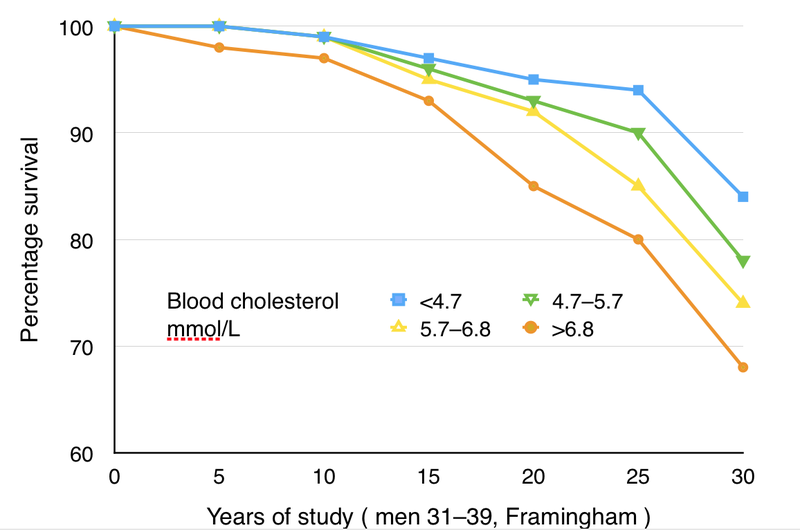 It is clear from the observational studies that a high blood level of cholesterol in people above the age of 60 years does not constitute a cardiovascular risk, but on the contrary a survival advantage. This is not new and the suppression of this information must stop. Observational studies such as the Framingham , Honolulu, Paris, and New Haven studies are very important. It is irresponsible of the authors of the Times letter, using impressive titles at the University of Oxford, to rubbish good quality observational studies, and completely ignore the findings of the highly-respected Framingham study and other studies. What has happened to scientific objectivity and analysis? Perhaps the answer is the pursuit of money. The diet–cholesterol–heart hypothesis is the goose that lays golden eggs, for the diet industry, the pharmaceutical industry, for academic departments, and for a large number of national and international conferences. Is the truth important? I think it is. Schatz IJ et al. Cholesterol and all-cause mortality in elderly people from the Honolulu Heart Program: a cohort study. Lancet 2001; 358: 351-355. Krumholtz HM, Seeman TE, Merrill SS, et al. Lack of association between cholesterol and coronary heart disease mortality and morbidity and all-cause mortality in persons older than 70 years. JAMA 1994; 272; 1335-1340. Keep on batting for common sense David. The cholesterol edifice is starting to crumble. It will take a long time for vested interest and protection of reputation by backwoodsmen to give way. The CHD rates in the UK and USA seem to correlate with the industrial revolution, no? Both the Uk and USA phased out industrialization in the 70's. The Industrial Revolution in the UK started 150 years before the onset of the epidemic of CHD. I agree that atmospheric pollution is a major factor in bad health, not just CH, and this was the case in Manchester UK in 1780! I believe that this is the result of poor sunlight penetration to ground level, and that is increasingly the case in industrialising cities today. Deficiency of sunlight and vitamin D is perhaps the most important factor in determining the distribution of CHD, but not its cause. The importance of vitamin D is generally very much underestimated. What you say is not true. Only the old studies - Framingham - have any meaning. In these it is only in men below the age of 50 that a high cholesterol has any predictive value. In more recent years observational studies cannot be undertaken as anyone with a high cholesterol (LDL or total) will be on statins and certainly not observed for natural history. The diet-cholesterol-heart hypothesis is obviously wrong. The persuasion that "the lower the cholesterol the better" is also wrong. Any benefit from statins is independent of the cholesterol-lowering effect.